Huge discounts on every item (over 10,000 items and growing). Low price guarantee - Just let us know if you find one of our products for less, and we'll match the price and add our club discount. Money-Back guarantee - If you don't save at least as much as the membership fee, we'll refund the difference. Create your BoatMania.com account and pay the membership fee with credit card or PayPal. 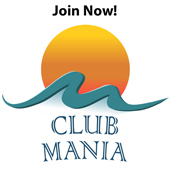 After payment confirmation, you'll automatically gain instant access to Club Mania and the incredible deals available only to members. © 2010-2017 Boat Mania. All Rights Reserved.